In 1916, with the support of the Georgia Federation of Women's Clubs, the Cherokee rose was named the state floral emblem. The name "Cherokee Rose" is a local designation derived from the Cherokee Indians who widely distributed the plant. The rose is excessively thorny and generously supplied with leaves of a vivid green. In color, it is waxy white with a large golden center. Blooming time is in the early spring, but favorable conditions will produce, in the fall of the year, a second flowering of this hardy plant. On April 6, 1935, the Brown Thrasher was first chosen as the Georgia state bird by official proclamation of the Governor. In 1970, at the request of the Garden Clubs of Georgia, it was designated by the Legislature as the official state bird. The Brown Thrasher is commonly found in the eastern section of the United States, ranging north to Canada and west to the Rockies. The bird migrates to the North in the summer and spends its winters in the Southern states. Almost a foot in length, the Thrasher has a long, curved bill and a very long tail. It has two prominent white wing bars, a rich brown color on its top side, and a creamy white breast heavily streaked with brown. MILLER, Zell Bryan, a Senator from Georgia; born on February 24, 1932, in Young Harris, Georgia; graduated Young Harris College 1953; served in U.S. marine corps 1953-1956; graduated University of Georgia, AB 1957, Masters 1958; businessman; professor of political science and history; mayor of Young Harris 1959-1961; Georgia state senator 1961-1965; member, state Board of Pardons and Paroles 1973-1975; lieutenant governor of Georgia 1975-1991; governor of Georgia 1991-1999; appointed to the United States Senate on July 24, 2000, to fill the vacancy caused by the death of Paul Coverdell; took the oath of office on July 27, 2000; elected as a Democrat to the United States Senate in 2000 for the remainder of the term ending January 3, 2005. Bibliography: Miller, Zell. Corps Values: Everything You Need to Know I Learned in the Marines. Atlanta, GA: Longstreet Press, Inc., 1996; Miller, Zell. 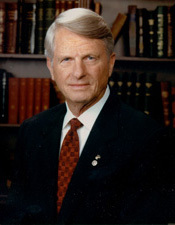 Listen to this Voice: Selected Speeches of Governor Zell Miller. Macon, GA: Mercer University Press, 1998. CHAMBLISS, Saxby, a Representative and a Senator from Georgia; born in Warrenton, Warren County, N.C., November 10, 1943; graduated C.E. Byrd High School, Shreveport, La. ; B.A., University of Georgia, Athens 1966; J.D., University of Tennessee College of Law 1968; attorney, Moultrie, Ga.; elected as a Republican to the House of Representatives for the One Hundred Fourth and the three succeeding Congresses (January 3, 1995-January 3, 2003); not a candidate for reelection in 2002, but was elected as a Republican to the U.S. Senate in 2002 for the term ending January 3, 2009.